The only thing I could add is that you can always look into `coordinatorAddress` property which is basically a string representation of `coordinator`. Yes, he confirmed that the issue isn't anything to do with jgroups. In my view, this might be a minor bug with Infinispan. Could you please tell me what Infinispan version are you using? It seems to work correctly with the latest release (or I missed how to reproduce it). We are using Infinispan 7.2.5 Final. Thanks a lot! Would you consider migrating into something more recent? We've implemented a lot of good stuff in 8.x series! Thanks for the reply @Sebasstian . Unfortunately we can't move to Infinispan 8 as it requires upgrading to java 8 and having java 8 in our systems is not possible at the moment due to various reasons. Was there any issue reported on this in Infinispan-7 that I could refer to? If yes, could you please point me to that? That would be a great help. We tried with Infinispan-8 and the issue is still reproducible. 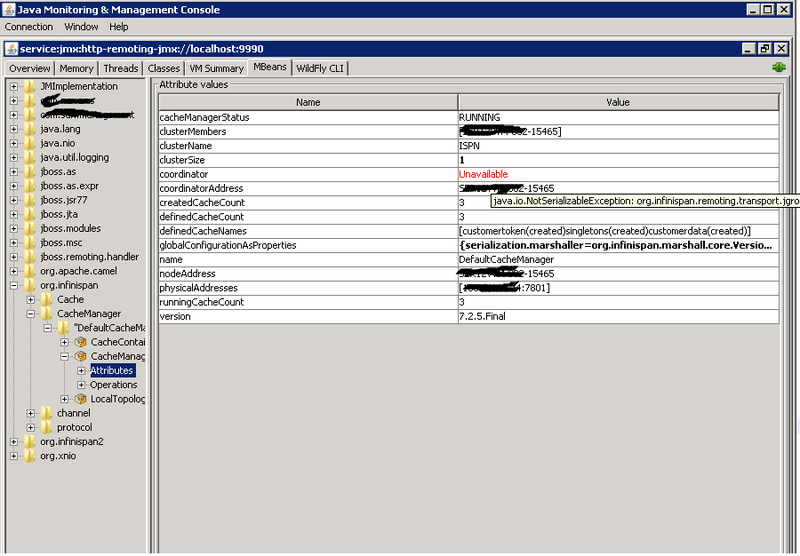 Ok, I created [ISPN-7643] Coordinator status is unavailable in Infinispan cluster - JBoss Issue Tracker to fix it. Thanks for pointing this out.